synchronized power adjustment, etc. are built-in. 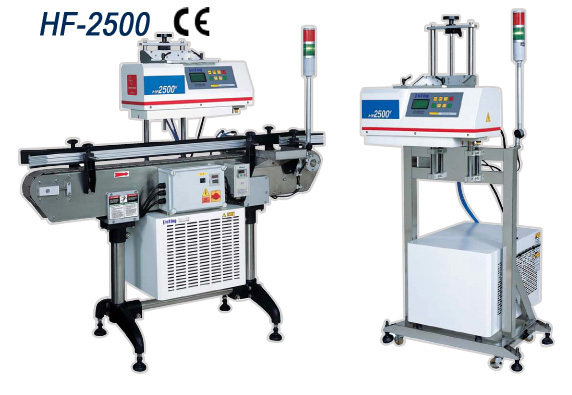 It is high speed and effectively cap sealing machine. ＊ All specifications,design and characteristices shown on the website are subject to change without prior notice. der contamination on sealing area. unsealed products from being delivered. ad, voltage overload and output overload. ．Modular component design minimizes maintenance requirements. ．A broad range of applications can be simply setup by button control. ．Quick adapters on power and control wires provide easy replacement. ．The IGBT/MOS-FET module provides high efficiency, low power consumption and long service life. ．Height of electro-magnetic induction coil is adjustable and flexible for a range of bottle heights. ．Employs European plastic steel chain block, combined with standardized accessories, for long service life. ．Suitable for screw caps, tamper-proof caps, etc.